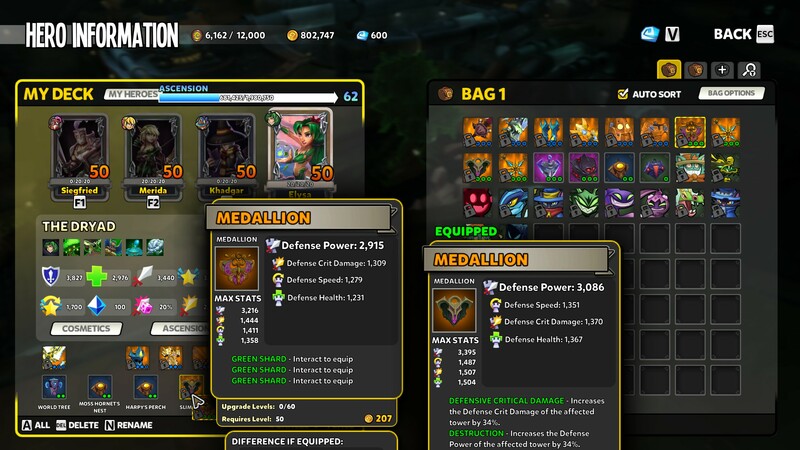 Comparing items in the inventory screen displays the comparison in a position off screen, making it impossible to view the comparison. Expected Results: Expected item text box positions moved positively along Y axis. Also affects the PC version. If similar shards are equipped on relics / armor, the "Difference if Equipped" box is also partially or completely hidden. Legendary items with their four stats are particularly affected. same problem with PC... the Game is now unplayable :/ Please Fix it quickly ! This is annoying, first I can't compare defense items to what I have cause the resolution on in is blocking it, but now the armor is doing the same thing. I know it's not me but please fix this on the PC.. Apparently if you move the gear to the top of your inventory you can actually see the stats, but it shouldn't function like that. I also don't like the changes to the control scheme. I'm surprised there hasn't been a hot fix for it already. It doesn't seem like a difficult fix unless there is a whole mess of problems that occured during the last update. I'm having this exact problem too, immediately since the v1.1 update. I really truly hope they don't wait until the next update because that would be at least an entire month not beeing able to compare stats without having to manually move each piece to the top row first? Could you imagine having to do that with every piece of loot that you obtain? Please don't wait until the next update. I like very very rarely see DD2 updates in-between the big updates, but I urge Trendy to fix simple crucial bugs in-between major updates. Also, it's not just the bottom of the inventory, even if it's the 2nd or 3rd row, it can be an issue. This general problem has existed since DD2 came out of beta, but was made worse in the Adept update. Devs: the current system computes the coordinates of the box based on cursor position. This is fine for X direction because the width of the box is fixed. However, this works badly in the Y direction. Please compute the height of both item card boxes with text filled in, and then properly position the boxes on the Y axis. PS to some comments below, I wouldn't say it makes the game "unplayable" but instead non-convenient. This is an issue that was around before full launch and is still persisting. you can manually compare each item but this is not quick and sometimes after a few rounds there can be a lot of stuff to compare. Someone PLEASE fix. PC AND console are having the same issue! Make the game playable again!!! This bug has been mostly addressed in patch 1.1.1, but not fully. Comparing Pets still does not work as expected, and the item boxes can fall off the bottom of the screen. It is now fixed for comparing equipped weapons and armors but this bug still occur in comparing equipped pets.